Who is Terra Little? I am a critically acclaimed author...an educator...a speaker...and this is my mostly literary blog. My new book news, the occasional virtual book tour stop, art and music, and film and T.V. stuff. Oh, and the occasional personal rant, too. We'll dabble in all of it from time to time. Life as we know it is a crap shoot, so why shouldn't this blog be? But the floor is always open to ideas and commentary. Welcome. 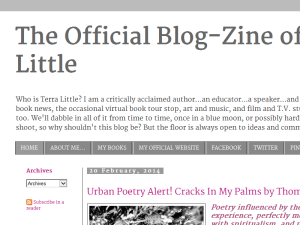 This what your The Official Blog-Zine of Terra Little Blog Ad will look like to visitors! Of course you will want to use keywords and ad targeting to get the most out of your ad campaign! So purchase an ad space today before there all gone! If you are the owner of The Official Blog-Zine of Terra Little, or someone who enjoys this blog why not upgrade it to a Featured Listing or Permanent Listing?